I think I should invest in stock for chipotles in adobo. It seems to be one of those ingredients that I always have in my house and I use it often. Never did I think, though, to add it to guacamole! And I love guacamole, too, so what an awesome pairing!! Making these tacos takes a few steps…to make the chicken, the quinoa, the beans, and the guac…BUT as long as you have enough burners on the stove, it can all pretty much be done at the same time. Which makes the total time to prepare about 15-20 minutes. You know how much I love those quick dinners!! Although, I did wind up making this for lunch on Saturday. J went fishing with a friend all day on Saturday and I wanted to have something that would be quick to throw together when he got home. This was definitely a good pick. And there was plenty for leftovers the next couple of days, too. Meanwhile, heat the vegetable or chicken broth in a sauce pan over high heat. Once boiling, add the quinoa and reduce heat to a simmer. Simmer for 10 minutes, until most of the liquid is absorbed. Remove from heat and let sit, covered, for about 5 minutes. Add lime juice and cilantro and stir to mix. Place the black beans in another sauce pan over medium heat, add garlic powder, chili powder, and cumin. Stir to coat and cook until warmed through, about 2-3 minutes. In a medium bowl, use a fork to mash the avocados until almost smooth. Stir in the chipotle in adobo, Greek yogurt, lime, and cilantro. Season with salt and pepper, to taste. 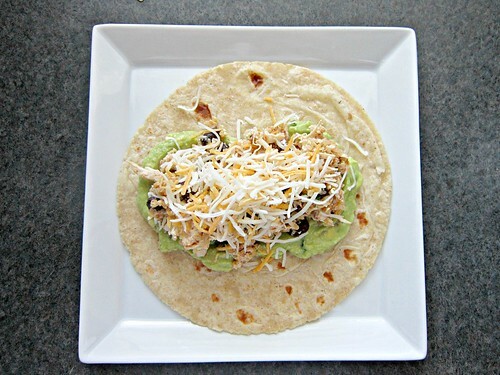 Warm your tortillas, then spread a generous amount of the chipotle guacamole down the center of each tortilla. Top with about 1/4 cup (or more!) 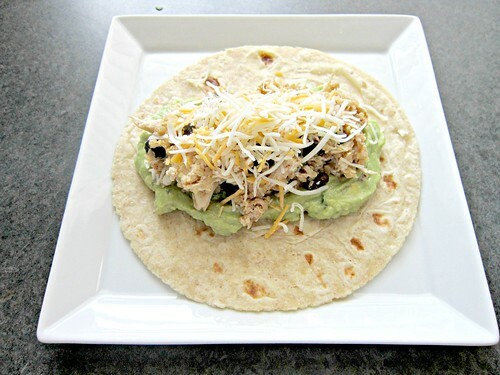 of the chicken, quinoa, black bean mixture, and a tablespoon or two of shredded cheese.